Pluto was the oldest of Zeus' brothers. After Zeus and his brothers overthrew their father, Cronos, they drew lots for the division of power. Pluto was the last to draw and was left with the underworld, hence he was designated as the god of the underworld and ruler of the dead. 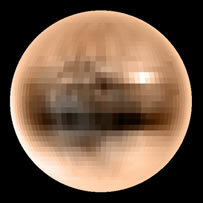 Pluto also ruled over the precious metals deep in the earth, and so was also the god of riches. There are other names for Pluto, but the most common of the earlier names is probably Hades, meaning "the unseen". Orginally, Hades was the name given for the home of the dead, where all souls go when they leave their mortal bodies. Hades rarely visited Olympus and was not very welcome anyway, since he was unpitying -- a terrible, but just god. It was the job of Hermes (Mercury) to guide the souls of the dead to the river Styx, where the ferryman, Charon, would take them across if they had money for their fare. If not, they had to wander around until they found the pauper's entrance. Hades lived in a dark, gloomy palace with his silent and icy wife, Persephone. Persephone had been laughing and dancing in a meadow with her mother, Demeter, one day, when the earth tore open below her feet. 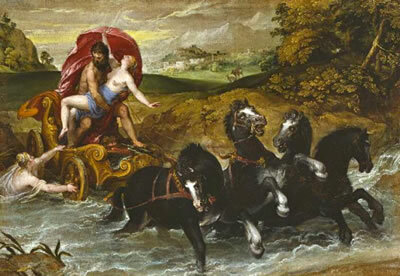 Hades rose up from the pit in a dark chariot and four black horses, grabbed the girl, and raced back down to his dismal palace. There, he sat her on a black marble throne and covered her in jewels. As she wept, her heart turned to ice. 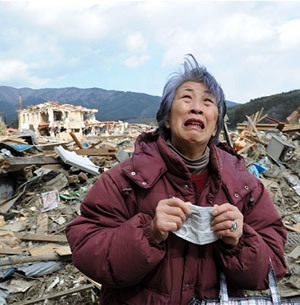 All she wanted was sunshine and flowers and her beloved mother. Eventually, Demeter convinced Zeus to get her daughter back. Hades had to obey and soon Mother and daughter were joyfully reunited. Unfortunately, before leaving the underworld, Persephone had absent-mindedly tasted the food of the dead. Hades smiled, knowing that she would have to come back. However, Zeus, in his kindness, ruled that she only had to go back for three months out of every year. So, every year when Persephone left her, Demeter would grieve and Hades would have his queen while there was winter on the earth. In the natal chart, Pluto shows where and how you handle the issue of power. It is often associated with the dark side of life...the ugly, seamy side that hides in the night. Because its movement is so painfully slow and it has such a penchant to wreak total devastation upon entire generations, Pluto is classified as one of the Transpersonal Planets. Pluto demands that we look at and deal with our obsessions and jealousies, our hatreds and resentments. Once purged, we can channel that power into mammoth undertakings. We can build the Panama Canal or the Hoover Dam. We can feel love as deep as the ocean. The house containing Pluto shows the extent to which you are comfortable exerting power over others and what you want to control. And since Pluto spends so very long in each sign, the sign it is in at your birth shows how you and your whole generation are experiencing the entire process of death and rebirth. Pluto is the obliteration of life and the creation of life. 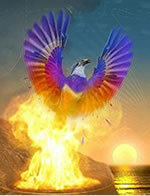 In our final breath, Pluto is the Phoenix rising. Pluto is the smallest, as well as the outermost and slowest moving planet in our solar system, taking slightly over 248 Earth-years to complete one orbit around the Sun. Its orbit is so eccentric that it spends as much as 26 years in Cancer and as little as 12 years in Libra. Pluto was discoverd by astronomer Clyde Tombaugh on February 18th, 1930 while working at the Lowell Observatory in Flagstaff, Arizona. Initially classified as a planet, Pluto was reclassified as a dwarf planet in 2006 when the International Astronomical Union (IAU) set more specific definitions of what constitutes a planet. Astrologically, the change has little impact on the functions and feel of Pluto. Pluto turns retrograde once each year. The retrograde periods last a little over five months, during which the pressure felt by its transits subsides .